On April 23, 1818, Captain Obed Wright of the Georgia militia ordered an attack on a Chehaw village, which resulted in the slaughter of several American Indians. In a letter written a week after the attack, Brigadier General Thomas Glascock reported it to his superior officer, General Andrew Jackson. Glascock’s account of the Chehaw affair is important not only for its description of how 230 militiamen killed "seven men . . . one woman and two Children" but also for how it shaped Jackson’s response to the massacre. The event shocked and angered Jackson because the Chehaw, a faction of the larger nation of Creek Indians, were then American allies in the First Seminole War. Just a month before Wright’s attack, General Jackson’s weary soldiers had sojourned in the Chehaw village while traveling from Tennessee to Florida. The local chief, known as "Major Howard" among the whites, fed and provisioned the men. Subsequently, many Chehaw warriors joined Jackson’s troops to help pursue the Seminoles. Glascock was in fact seeking out their hospitality when he learned of the massacre by Wright’s men: "I sent on Brig Robinson . . . to [pro]cure Beef[.] on his arriving there the Indians had fled in every direction[,] the Chehaw Town having consumed about four days before by a party of men . . . under a Capt Wright." As Glascock explained, Wright had learned of a skirmish between white settlers and two Creek tribes—the Hopaunees and the Philemmees—and "immediately sent or went to the Governor and obtained orders" to raze their towns. Instead of attacking the marauding Hopaunees and Philemmees, however, Wright’s men attacked a Chehaw village that was not responsible for the reported violence against the settlers. There is no definitive account the massacre, but historians agree that Wright burned the village and, as Glascock recounted in his letter to Jackson, viciously murdered innocent men, women, and children. Glascock narrated Wright’s terrible misjudgments in obtaining and following his orders from the governor. After capturing a young Chehaw, Wright did not oblige his request to "bring any of the Chiefs for the Capt to talk with." Instead, Wright "ordered the Cavalry rushed forward and commenced the massacre even after the firing and murdering commenced maj Howard . . . came out from his House with a white flag in front of the line. it was not respected . . . he fell and was Bayoneted." Jackson viewed the incident as shamefully disloyal and extremely dangerous, with the potential to turn the friendly Chehaws, who Glascock described as "at a loss to know the cause of this displeasure of the white People," into enemies. 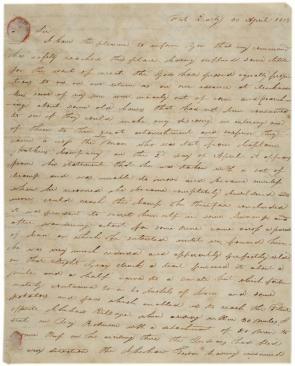 Soon after he received Glascock’s account of the massacre, Jackson wrote to the William Rabun, the governor of Georgia, calling Wright a "cowardly monster in human shape" and demanding that "Capt. Wright must be prosecuted and punished for this outrageous murder." 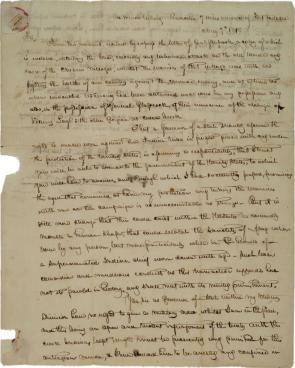 Secretary of State John Quincy Adams followed up with another letter to Governor Rabun, telling him that "The President of the United States has directed that Captain Obed Wright should be prosecuted for the murder of friendly Indians." Wright was eventually arrested by one of Jackson’s agents but broke parole and escaped to Spanish Florida before he could be tried. Wright was never heard from again, and no one was ever held responsible for the massacre of the Chehaws.
. . . mock patriotism burned in their Breasts they crossed the River that Night and pushed for the Town when arriving near there an Indian was discovered grasing some Cattle he was made a prisoner by Sergt James, that the Indian immediately proposed to go with the Interpreter and bring any of the Chiefs for the Capt to talk with, it was not attended to an advance was ordered the Cavalry rushed forward and commenced the massacre even after the firing and murder commenced maj Howard an old Chief . . . came out from his House [w]ith a white flag in front of the line. it was not respected. an order for a general fire was given, and nearly 400 guns were fired at him before one took effect he fell and was Bayoneted. his son was also killed. these are the circumstances relative to the transaction. seven men were killed one woman and two Children . . .
. . . But it is still more strange that their could exist within the U.States a cowardly monster in human shape, that could violate the sanctity of a flag when borne by any person, but more particularly when in the hands of a superannuated Indian chief worn down with age. Such base cowardice and murderous conduct as this mans action affords has not its paralel in history, and shall meet with its merited punishment.
. . . this being an open and violent infringement of the treaty with the creek Indians Capt. Wright must be prosecuted and punished for this outrageous murder, & I have ordered him to be arrested and confined in irons until the pleasure of the President of the United States is known upon the subject. If he has left Hartford before my order reaches him, I call upon you as Governor of Georgia to aid in carrying into effect my orders for his arrest and confinement, which I trust will be afforded, and Capt. Wright brought to condign punishment for this unprecedented murder. “The Fog of War” is a phrase often used today to describe conditions that permit horrible mistakes in war. Explain why this modern term might apply to the massacre perpetrated upon the Chehaw villagers described in these letters. Using information from the letters, describe how this incident illustrates the complex and troubled relationship that existed between whites and American Indians in the early nineteenth century. To what extent can we question the motives behind Jackson’s expressions of horror at this massacre of innocents? Briefly describe Jackson’s role in the First Seminole War that preceded this incident.